Auto transporting is a huge modern-day industry thanks to Ebay. It operates differently than most of today’s industries and shipping companies or merchandise. Read on to learn how to break into this growing industry. Find a company you are interested in and go directly to their website for a quote, or find a website that you can receive quotes from 5-10 companies. You must enter all information correctly to receive the most accurate rate. Most automatic quotes that you will receive are for operable, standard passenger vehicles. Cars with modifications (i.e. lift kits, lowered suspensions, bigger tires) and cars that do not run cost additional money for the size, weight and conditions for the carrier. DO NOT GO WITH THE LOWEST PRICE. Many companies lure unsuspecting customers with the lowest bid. They then need to locate a carrier to physically move your vehicle. If the carrier does not accept the low price (and generally they do n not) then your vehicle will not be moved. A lot of companies low-ball customers into using their company. NEVER PUT DOWN A DEPOSIT Companies that request a deposit often times are banking on the fact that once you have paid for their services, you will not want to go through the hassle of canceling, fighting to get your refund, etc. The proper way for you to pay for the broker's services is to pay only after you have received the name of the carrier, the approximate dates for pick-up and delivery, and the name and phone number of the driver assigned.Only let them charge your car once a carrier is assigned to move your car. DO YOUR OWN RESEARCH Call multiple companies, ask friends if they have ever used a transport company. Review quotes, terms & conditions, reviews posted on the internet, and BBB ratings. Make sure they have been in business at least a few years. This is a highly unregulated industry, and many less than desirable companies pop-up with new names every few years to strike unsuspecting customers again and again. Make sure the brokers are bonded and make sure the carriers they assign are licensed and insured. BOOK YOUR ORDER Make a decision about which company to use and book your transport. Make sure to have a confirmation via fax or email. Read everything a company sends you before signing it. Be aware that if you place a reservation via internet, your e-signature is binding once you click send or submit. PREP YOUR VEHICLE Prepare your vehicle for transport by removing all personal or valuable items. Auto carriers prefer you have less than a quarter tank of fuel because it greatly decreases the weight they carry and the less weight they haul the better the fuel economy while driving from point to point. The less it costs them the less it will continue to cost you!! It is a good idea to wash vehicles before the inspection report at pick up. This ensures the car's condition is readily recognized before transit. CARRIER WILL INSPECT THE VEHICLE At pick-up, the driver will inspect the car for any existing damage. They will footnote the damage on a VEHICLE CONDITION REPORT. They will ask you to sign it and will hand you a copy of the report for your records. Keep this with you until the car is delivered. CUSTOMER WILL INSPECT THE VEHICLE Upon delivery, the customer will inspect the car to ensure there are no additional dings, dents or scratches. This is your only opportunity to claim damage, so please take your time. If any damage is claimed, make sure the carrier signs the condition report and make sure you retain a copy for your records. PROFESSIONAL AUTO CARRIERS These auto carriers provide a vital service and deserve respect and admiration. They do an extremely hard job and should be compensated fairly. Best of luck with your auto transport experience. All companies should do inspection reports of the vehicle at pick up and delivery. Be sure to document the mileage on the car before and after transport. In case of damage, it is your responsibility to make sure these reports are correctly updated to prove and ensure reimbursement for the damages. Be honest with the company you are contacting in regards to any personal items you have in your vehicle. Trucks are weight limited and are weighed in each state they travel across. They can be charged large fines in every state for being overweight. Also, most companies will not insure any items inside the vehicle. It is usually best to send your car empty on a truck. Read the contract completely before signing. Be wary of hidden fees that are listed in the small print on the contract. Research a company very well, and make sure they are Members of the Better Business Bureau, Bonded, Licensed, and Insured. DO not pay anything upfront!! We can not stress this enough. And make sure you do not go with the lowest priced companies. Companies priced in the middle are the most reliable in our experience. When you make a reservation, do not book with another company as this will hinder your transport. When two companies are trying to move the same vehicle, most drivers will 'pass' on that vehicle and go to another. Never pay a deposit before work has been done for you. Example they have a carrier assigned and have given you their pickup and delivery date, and their name and phone number. A credit card number for reservation is appropriate, but there should be no charges applied until the driver has been assigned. This is NOT a guaranteed industry. 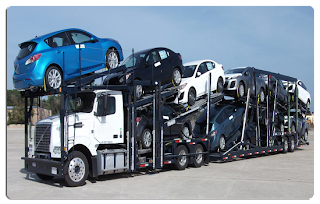 This industry has many factors that may create delays; such as, waiting for earlier customers at pick up or delivery, weather, mechanical problems, and road constrictions for multi car carriers. Be careful not to go with a low-priced company!! Companies out there will give you a low price, but will not be able to find transport for your vehicle. All brokers use the same carriers. And they usually only move the highest paying bids. Most of these companies will charge you a upfront deposit. Do not pay ANYTHING until your car has been assigned to a carrier. Because if they fail to have your car moved because of the price or because they are in experienced you will have to fight them to get your refund back.